Monarch Cave is located in Butler Wash on the east side of Comb Ridge near Bluff, Utah. A short trail leads from the trailhead up a narrow canyon to a cave that contains the remains of an Ancestral Puebloan cliff dwelling. The cave and surrounding area makeup a nice outdoor museum with many traces of the daily activities of its ancient inhabitants. Besides the ruins visitors are treated to some petroglyphs and artifacts that include pottery sherds, corn cobs, sharpening grooves and metates. Like numerous other places in the southwest the Comb Ridge area has many locations where hikers can find ruins and panels of petroglyphs. Unfortunately most of these locations are hard to find without buying a book or paying someone for the information or to guide you there. In the spirit of this website to provide free information for hiking trails and other places of interest we have mapped out the trailheads. Your odometer may vary slightly but these distances should be good enough to get you to the trails. The mileages are measured from the Butler Wash turnoff on Highway 163 about 4 miles west of Bluff, Utah. The Monarch Cave trail begins in the southwest corner of the parking area. 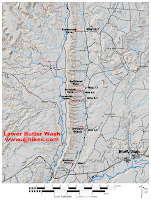 Since there aren't any signs in the Butler Wash area with the trail names on them it may not be completely obvious that you are in the right place. Some of the trail names are stenciled on one of the logs in the parking area. It is common to find people camping right at the trailhead so you might have to walk through their camp to find the trail. Like the rest of the trails in the area you have to hike through Butler Wash to get across to Comb Ridge. For hikers that might not have a lot of experience with primitive trails a common practice to be aware of is to watch for sticks, branches or logs laying across a trail. They are often placed across side trails that may have been created by livestock, game animals or confused hikers as a subtle suggestion to look for an alternative route. Rather than mylar trail markers that clearly show the correct route you will have to depend mostly on these less obvious indicators in the Butler Wash area. Once the trail enters the confines of the canyon there are fewer side trails and the hike becomes a pleasant jaunt with a mix of open sunny stretches and cool shady areas. Near the head of the canyon the trail forks. 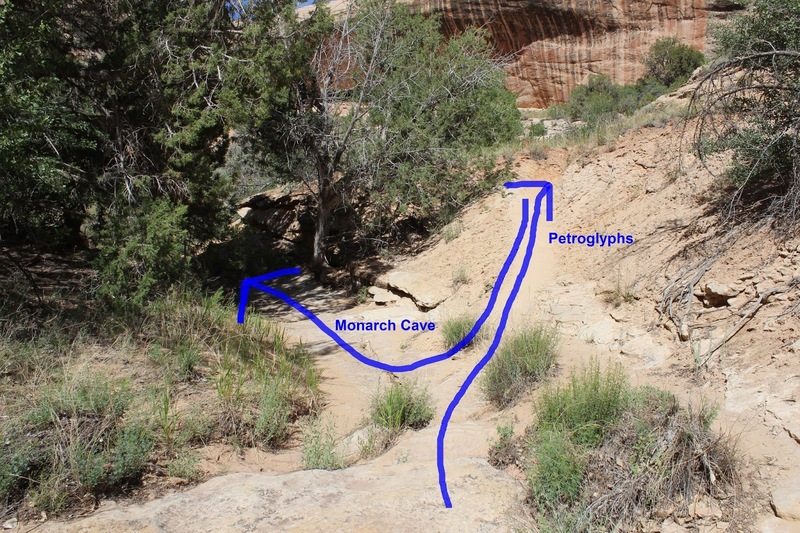 The right side leads up onto a small bench area where you will find some petroglyphs, pottery sherds and one of the best views of the ruins in Monarch Cave. Most of the petroglyphs are so exposed to the elements that they have faded considerably over time. There are so many sharpening grooves in the area we were joking that they must have been preparing for a war or something. Perhaps they just lived here a long time. It is really nice when you get to places like this and find that all of the artifacts haven't been carted off in peoples pockets which everyone knows is illegal. It is easier to get into Monarch Cave by going back down into the wash and finding the trail that climbs up the other side of the canyon. There is a little bit of poison ivy to watch out for and the last 10 feet or so of the trail that leads up to the ruins has a lot of loose scree on a narrow path. A small section of thatched roof shows the construction technique that was commonly used. Some of the ruins that you come across in the southwest are up to 3-4 stories high and this same method of construction was used between the floors. This is a broken metate that was used for grinding corn, nuts and seeds but it is still pretty cool to see. Once you see the water source it is much easier to see why the cave was a good location to live. Crops of corn, beans and squash were probably grown in the head of the canyon below the cave. We checked out an alcove on the hike out and found a spot that you could probably stash your most valuable possessions. The entire opening was entirely blocked by poison ivy. There are several paths through the foliage that were probably made during the winter months when the oily leaves have fallen away. 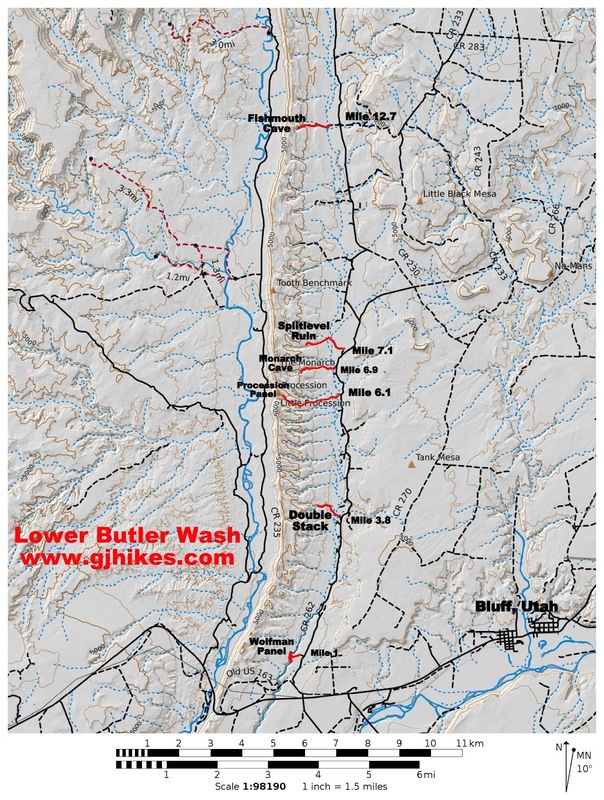 Butler Wash is popular because visitors can see multiple ruins in one day by making a series of short hikes. Camping is free for those that can find a spot to put up a tent. There aren't any toilets or other improvements so you have to bring everything you will need, including water, with you. The Butler Wash Road is listed in a lot of 4x4 books and magazines but as you can see we made it just fine in our little 2-wheel drive truck. We even saw one person in a pretty nice car but it seemed like a pretty crazy stunt to us. Some sections of the road have 5 or 6 inches of loose sand. A lot of the slickrock has had a pavement grinder run over it to smooth out the high spots. 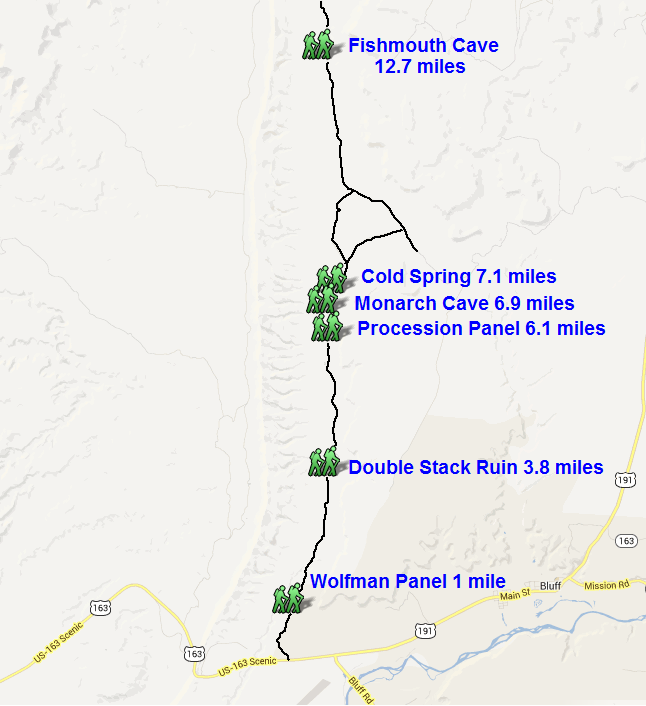 However you make it in Monarch Cave is fun to visit. If you would like to see it for yourself then all you have to do is 'Take a hike'.